In 1821, my great-great-great-great-grandfather John Leckie immigrated to Canada from Scotland. He was tempted to leave his occupation as a weaver to try his hand at farming in the new land by an offer by the Canadian government of 100 acres of land free to new settlers. The government would also pay to survey the land, and cover their travel expenses from the port of landing in Quebec to their new home. He and his wife, along with their 9 children aged 15 years to 4 months, arrived at the new homestead after 46 days at sea and a long trek by wagon along muddy, often near-impassable roads. The land they were given lies not far north of our new home, in the middle of Lanark County. This weekend Dan and I decided to take advantage of a break in the rainy weather to see some of the landscape north of us. We made a short detour to visit the original Leckie homestead. 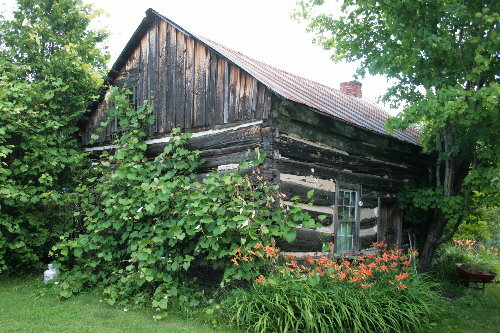 The original log and beam cabin still stands at its original location, just a short distance south of Dalhousie Lake. As homes go they could have done worse, it’s a beautiful area, with the lake right nearby, although the rocky landscape and thin soils aren’t ideal for farming. Still, they managed to eke out a living from the unforgiving land, raising 12 children over the years. The children grew, married and moved away, most of them to Lambton County in southwestern Ontario, much more favourable farmland. 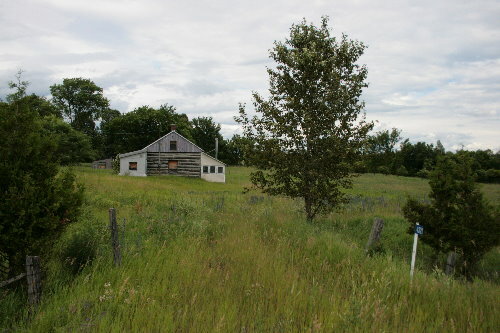 In 1867, at the age of 89, John Leckie and his wife sold the homestead they’d inhabited for 46 years and moved in with one of their sons. The cabin has changed hands a number of times since then, sometimes lived in, sometimes left untended. When the clan history book was revised in 1994, they provide a bit of information on its recent history. 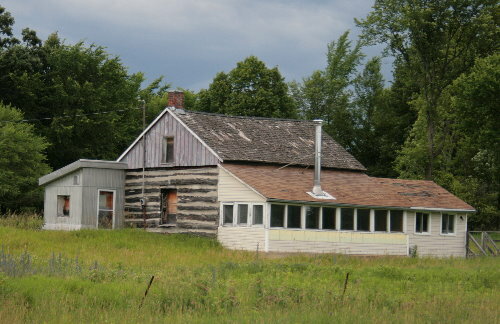 It seems it stood vacant for many years until it was purchased by a couple in the early 1980s with the intention of turning it into their retirement home, building some additions and restoring the original cabin. Unfortunately, as sometimes happens, both died within a few years of retirement, and were cheated of the opportunity to really enjoy the place. 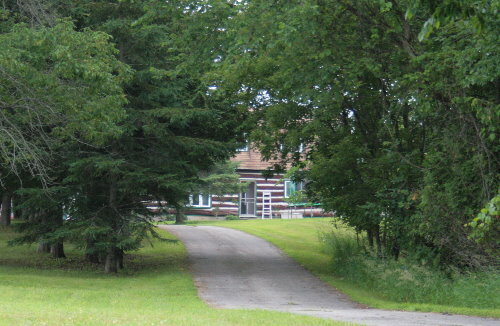 When the cabin was resold in the mid-1980s, the new owners dismantled the old barn and used the logs to build a new home across the road. The house is hidden in the trees and not much can be seen from the road; I didn’t want to intrude by walking up the driveway. 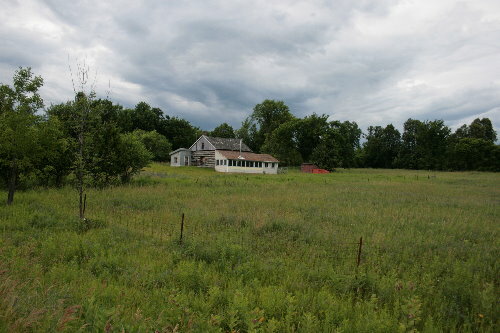 The land surrounding the old cabin continued to be cut for hay, but I gather the house was no longer lived in. When we visited, the house was looking a little the worse for wear. The windows were boarded up, and the roof was missing some shingles. If it still belongs to the same owners, then it’s possible it hasn’t been lived in for 20 years. There’s a part of me that would want to buy it to restore it and fill it with love again; it seems sad for something with such history to be forgotten and fall into such disrepair. Ultimately, I don’t think it’s the sort of house Dan and I would want as our permanent residence, but maybe someone else will buy it and take care of it. I’m reminded of the old structure that stands near the house we’re currently renting. I gather this is the original farmhouse for this concession, as well. I believe that when the owners of the house we’re renting were building it, nearly 30 years ago, they stayed in this old house temporarily. In the years since it’s been used primarily for storage. I wonder what stories it could tell. What a great post of your family’s old homestead. Old houses have a silent language to tell who ever is interested — look for landscape over time, construction material, wind direction, adz marks, everything etc. that completes a context leads one to the story of the place. Cool. What a coincidence that you ended up living so close to the family homestead. Make them an offer. Must be providence. Do as your mother tells you. No, really, though, now that E.g. and I are in a position to buy a house, we’re amazed at how clear we aren’t on what we want — there are so many variables! So I can imagine, maybe, your pull between practicality and wanting the original family farmstead (although you’re not planning on filling it with twelve wee bairns, are you? ) . Very beautiful, and it must be amazing to wander a place with so many old memories. If only the wood and hills could talk! hello I only write spanish , I,m looking to take care somebodys home or land in homestead florida if you know someone email me martha .Wrote by my doughter lisa.